The Intersections & Beyond: Net25 and CCP launch second season of "On Set"
Net25 and CCP launch second season of "On Set"
ON SET, the only Philippine talk show on NET 25 that features Filipino artists at their best, presents its second season with the country’s top caliber arts and culture personalities. 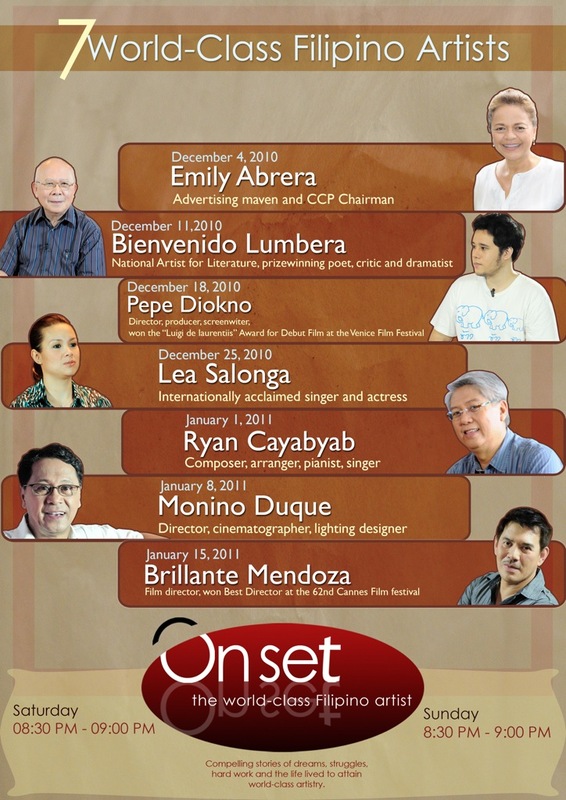 This was held at the Silangan Hall of the Cultural Center of the Philippines (CCP) on December 1, 2010. ON SET documents the personal life, training, and the private and professional experiences of the artist that have helped him become truly a world-class talent. 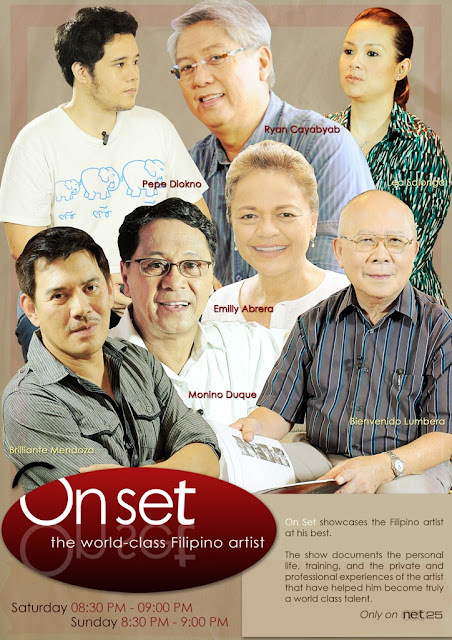 World-class artists lined up for the new season of ON SET include CCP Chairman and advertising maven Emily Abrera; National Artist for Literature, prize winning poet, critic and dramatist Bienvenido Lumbera and Venice Film Festival winner Pepe Diokno. Internationally acclaimed singer and actress Lea Salonga who personifies the Filipino world class artist is one of the highlights of the season. She is also joined by composed, arranger, pianist and singer Ryan Cayabyab; director, cinematographer and lighting designer Monino Duque; and film director Brillante Mendoza. The second season began on December 4 (Saturday) at 8:30 pm with replays on the following Sunday at 8:30 pm. Alongside with the launch of On Set's second season is the signing of the Memorandum of Agreement of CCP & Net25 for their continuous collaboration.